Imagine if you married the daughter of a businessman who owned various companies across the country? If you were living a good life before your wedding, you can be assured that you’ll live a much better life after the wedding because such a father wouldn’t want his daughter to lack anything. How much more our God that owns the heavens and the earth in all its entirety? A male friend of mine that recently got married confided in me that his wedding cost 35,000 dollars- an amount that caused him to stagger when he first heard the budget. But somehow, things started falling into place. He had been struggling to get a job but after sealing the deal, a top position in a foreign country opened and he got it, he got a beautiful new car, he got more money than expected from his research group, he became blessed in every way…. I smiled as he testified to God’s goodness- he married God’s daughter. God’s daughter is beautiful inside and out, she has a heart of gold, she’s ready to give, ready to support, she’s thankful even when life offers sour lemons, she lives by God’s word, she praises Him even when she’s being tormented by the devil. God’s daughter is not lazy; she doesn’t sit around and expect everything to be handed out to her! She gets up every morning with a plan to do something great with herself. God’s daughter is decent in her appearance, she is decent with her language, she doesn’t curse and swear at everyone on the street. God’s daughter is imperfect and she knows it but she accepts her imperfections and believes there’s a lot for God to carve into her. God’s daughter is a pillar of strength to her man. She is ready to fight their relationship battles in prayer, she is loving, selfless and kind. No matter how successful she is, she is humble and submissive, though she’s assertive and strong when the need arises. It is a proven fact! 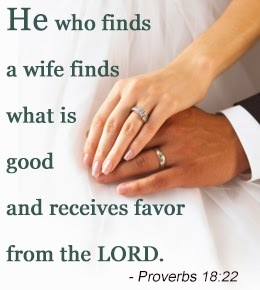 When you marry God’s daughter, he has no choice than to bless you richly. He doesn’t want the apple of his eye to lack anything so he will fill your heart and home with joy! This is not to say men are not precious to God. We all are, irrespective of gender but you have to agree with me, there must be something special about a woman that made King Solomon write that verse.